Saranac Lake Village Hall is located at 3 Main Street, Saranac Lake NY 12983; phone: 518-891-4150. Photo: Peyton Clark Cottage (also known as Woodthorpe), ca. 1915, 9 Rockledge Road, Saranac Lake, Essex County, NY. Listed on the National Register of Historic Places in 1996. Photographed by User:Mwanner (own work), 2008, [cc-by-3.0 (creativecommons.org/licenses/by/3.0)], via Wikimedia Commons, accessed August, 2013. New York appropriated land in the Adirondacks in 1781 for the purpose of providing a bounty for soldiers who had served in the Revolutionary War. The area eventually became known as the Old Military Tract. The area was settled first around 1819 by Jacob Smith Moody. He settled along a road that is, today, Pine Street in the village. Other early pioneer families were Captain Pliny Miller who came from Rensselaer County, and Colonel Milote Baker. The village lies partly in Franklin and partly in Essex counties. 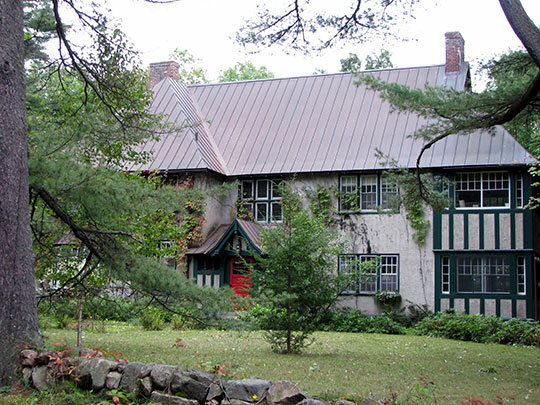 See Saranac Lake/Franklin County for more information and links to village historic districts.